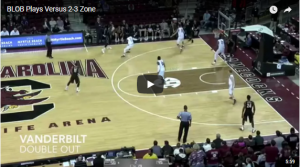 Army Men’s Assistant Coach Zak Boisvert has assembled some of his favorite baseline inbounds plays to run against a 2-3 zone defense. Click the play arrow to see the plays. Some plays are shown more than once. The teams don’t always score on the plays, but I hope that you can get some ideas for some cuts, screens, and movements that you might be able to use either in your Under out plays against a 2-3 zone, or adapt them to include in your system of attacking a 2-3 zone.